I just watched that trailer and it looks very impressive, very slick and polished although I couldn't spot Jason Isaacs. Maybe those disgruntled fans expected a more ' retro ' look ? This new show is certainly significant in being the first on going trek series since ENTERPRISE. 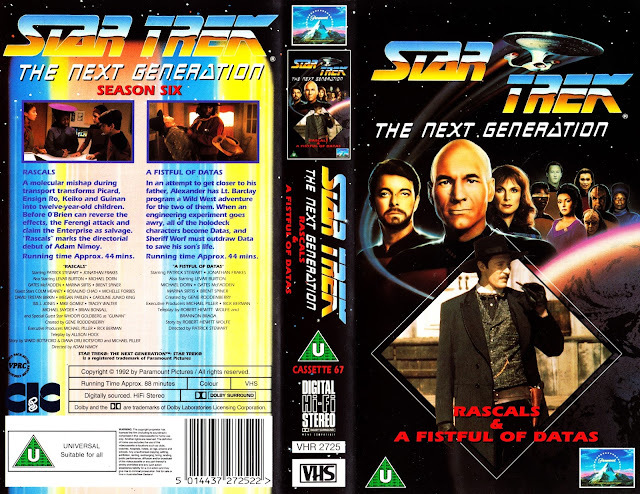 that ST:TNG cover will make long time readers of STARBURST nostalgic for the old video column where the latest release would appear. Fans may be right in thinking CBS is milking them by expecting them to pay twice: CBS All Access is a Video On Demand streaming service where the weekly episodes of the show will debut, but the CBS parent network is where the feature-length pilot will be broadcast, so people will have to subscribe to the parent network (or whatever their local package is) and then pay for each and every episode of the show they signed up to the network to watch. Meanwhile, everyone else will either watch for free via bittorrent, or pay one subscription to Netflix and then binge-watch everything in one go. Merchandising companies, sponsors, and Netflix - the people who would be co-bankrolling the show since the advertising-funded model of regular tv was no longer applicable - were the ones who wanted the show to be retro, because that's where the real Trek money comes from, apparently. Original Discovery show runner Bryan Fuller said it was one of the first things they decided, with fans (probably still smarting from Enterprise) seeming to prefer a TNG-era show, but it seemed like they really came around over time, as I recall some of the original reactions were hostile and dismissive, more recently becoming optimistic about the show even after Fuller departed under a cloud. To be honest, most of the reactions I've seen to the trailer have been far more ebullient and optimistic than my own, though I stand by my assertion those uniforms are absolutely awful and even dayglo polo necks would have been better. my first reaction to those uniforms was " they look like tracksuits or wetsuits. " TRANSFORMERS UK comic has a spin-off title out now called RESCUE BOTS. aimed at a more juvenile readership but still worth getting.